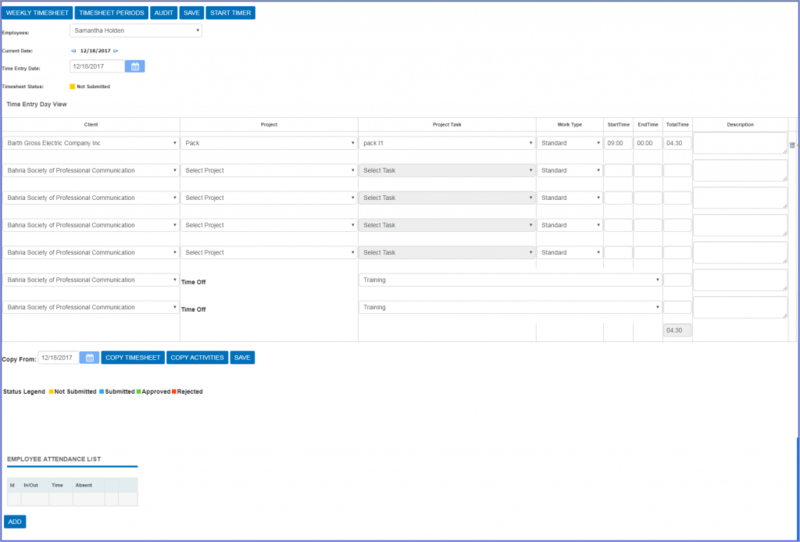 Using day view of time entry, an employee can enter daily timesheet with full view of whole day. Employee can submit these time entries for approval by clicking on [Submit] button. Time entry day view can be access using <My Area >– <My Timesheet >from the main menu. The easy single format for entering whole day time entries for different project and task in single save. Day view of time entry also supports both two types of format. You can customize this option using Admin option –> Preferences (Show Clock Start/End] option. By default, OfficeTimer always gives two blank rows in day view to entering new timesheet record. You can continue on adding new row in time entry record from next row. If you want to add more row, save it first and then OfficeTimer system will give additional 2 rows for entering more records. Click on [Delete] button of record which you want to delete. Click on [Yes] to confirm this delete. Navigate to field which you want to change. Change your content in that field. Click on update to save this update. Submitting time entry can be done only from week-view. Just navigate to week-view and click on submit button to submit that whole week.